Brassica species are known to possess significant inter and intraspecies variability in salinity stress tolerance, but the cell-specific mechanisms conferring this difference remain elusive. In this work, the role and relative contribution of several key plasma membrane transporters to salinity stress tolerance were evaluated in three Brassica species (B. napus , B. juncea , and B. oleracea) using a range of electrophysiological assays. Initial root growth assay and viability staining revealed that B. napus was most tolerant amongst the three species, followed by B. juncea and B. oleracea . At the mechanistic level, this difference was conferred by at least three complementary physiological mechanisms: (i) higher Na+ extrusion ability from roots resulting from increased expression and activity of plasma membrane SOS1-like Na+/H+ exchangers; (ii) better root K+ retention ability resulting from stress-inducible activation of H+-ATPase and ability to maintain more negative membrane potential under saline conditions; and (iii) reduced sensitivity of B. napus root K+-permeable channels to reactive oxygen species (ROS). The last two mechanisms played the dominant role and conferred most of the differential salt sensitivity between species. Brassica napus plants were also more efficient in preventing the stress-induced increase in GORK transcript levels and up-regulation of expression of AKT1 , HAK5, and HKT1 transporter genes. 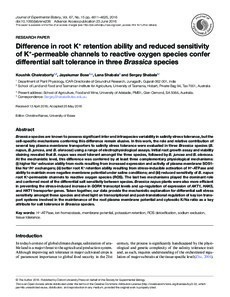 Taken together, our data provide the mechanistic explanation for differential salt stress sensitivity amongst these species and shed light on transcriptional and post-translational regulation of key ion transport systems involved in the maintenance of the root plasma membrane potential and cytosolic K/Na ratio as a key attribute for salt tolerance in Brassica species.